Perhaps the best known activity of Shu and Tefnut was to give birth to two children, Geb and Nut; Shu was then responsible for separating the two and creating fro them the earth and sky. Geb was the god of the earth. The coffin Texts told of Ra's boredom the chief god complained he had been too long at leisure, and had grown weary of it:" If the earth were alive,"Ra thought, "it would cheer my heart and enliven my bosom." so the earth was created both to make Ra's life more interesting and to give him a place to rest when he became weary. The usual depiction of Geb was as a male figure wearing on his head either the white crown of Lower Egypt or a goose. The goose was his sign and he was known in the Book of the Dead as the Great Cackler. Since he was the god of the earth, which was known as "the house of Geb," he was involved with life on the surface and with death beneath. On the earth's surface he was responsible for trees,plants and seeds that put their roots into his soil. Beneath the ground he was responsible for dead bodies buried in tombs. Since he was intimate with the dead, he was shown in many papyri as one of the gods sitting in judgment when the heart of the deceased was weighed on the scales before Anubis and Thoth . On one occasion Ra called Geb before him to complain that the snakes of the earth were causing him trouble. As they came from Geb's territory, they were his responsibility, and Geb was ordered to keep a watch over the snakes and inform the other gods of their plans and activities. Ra promised Geb help in this matter, in the form of spells and charms for people intelligent enough to make use of them to draw the snakes out if their holes in the earth. The assumption must be that Geb did as he was commanded since nothing else seems to have been said on the subject. Much of Geb's fame lay in the children he fathered , since his offspring were to become the next generation of powerful gods. he and Nut produced, as we have seen, Osiris, Isis , Seth , and Nephthys, the gods who were to rule over the earth, skies , and underworld. 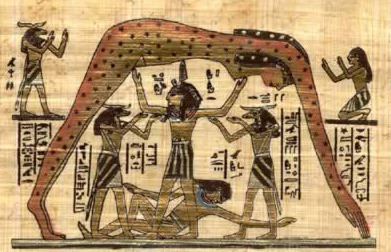 A hymn to Osiris described the manner in which Geb turned over the rule of the earth to his son: Geb " assigned to ( the leadership of the lands for the good of affairs. he put this land in his hand, its water, its air, its verdure , all its herds , all things that fly, all things that flutter, its reptiles , its game if the desert, legally conveyed to the son of Nut. " later , when Osiris was confronted by enemies and in serious trouble, his father came to his aid. The Pyramid Texts tell us that Geb put his foot on the head of Osiris' enemy , who then retreated2a . Another document placed Geb in the conflict between Horus ( his grandson ) and Seth ( his son). he tried ti separate his warring heirs and assigned Upper Egypt to Seth and Lower Egypt to Horus, but he made it clear in a speech before the Great Ennead that he was giving the choice territory ti Horus because he was the son of Geb's first-born and therefore very dear to him. Geb and Nut were accorded no temple of their own, though Geb was apportioned parts of major temples, such as the one a Dendera. Most likely he was chiefly worshiped at Heliopolis where he was the ground in which the temple to Ra was built. In the Tutankhamun collection at the Egyptian Museum, there is gilded wooden statue of Geb that had been placed in the tomb to protect the Boy-King.